EuropaCorp unveiled this new image from 2017's "Valerian and the City of a Thousand Planets" at the 2016 San Diego Comic-Con on July 21, 2016. Actor Dane DeHaan (seen here) stars as Valerian in the science fiction adventure film. The science fiction action is in full swing at the 2016 San Diego Comic-Con in California today (July 21), with director Luc Besson and EuropaCorp unveiling this latest image from their upcoming 2017 space film "Valerian and the City of a Thousand Planets." Besson and the Valerian cast also discussed the new film during a Hall H panel at SDCC. Based on the classic "Valerian and Laureline" graphic novel series, Besson's new film will chronicle the adventures of its titular Valerian (Dane DeHaan) and Laureline (Cara Delevingne) as they try to maintain law and order in the universe as special governement operatives of the human territories. 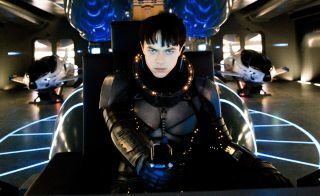 DeHaan takes center stage in the new image, which shows him clad in a sleek black spacesuit with what look like some awesome single-seater spaceships in the background. Director Luc Besson's science fiction epic "Valerian and the City of a Thousand Planets" will be released in 2017. EuropaCorp also released some juicy tidbits about the new film. "Valerian has more in mind than a professional relationship with his partner — blatantly chasing after her with propositions of romance. But his extensive history with women, and her traditional values, drive Laureline to continuously rebuff him," the production company's synopsis reads. "Under directive from their Commander (Clive Owen), Valerian and Laureline embark on a mission to the breathtaking intergalactic city of Alpha, an ever-expanding metropolis comprised of thousands of different species from all four corners of the universe. Alpha's seventeen million inhabitants have converged over time — uniting their talents, technology and resources for the betterment of all. Unfortunately, not everyone on Alpha shares in these same objectives; in fact, unseen forces are at work, placing our race in great danger." In my youth, I had the good fortune of stumbling across old copies of "Valerian and Laureline" at the library, so to say I'm excited to see Besson's new take on "Valerian" (especially after seeing what he did with "The Fifth Element," which is on my all-time favorites list) is an understatement of truly cosmic proportions. I look forward to seeing how Besson's Valerian universe takes shape leading up to the film's debut next year! "Valerian and the City of a Thousand Planets" is currently slated for a July 21, 2017 release. You can learn more about the film at its website here.